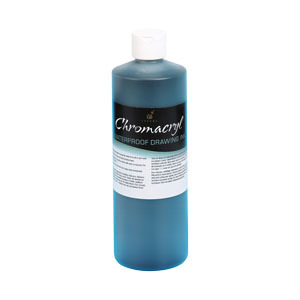 Chromacryl Drawing Ink is a general purpose water soluble black ink. It is waterproof when dry and can be used on its own or diluted with water to achieve different tones of grey. Ideal for pen work and brushes. When using a fine pen, mix equal parts of ink and water to ensure no clogging. Chromacryl Drawing Ink is easy to clean up with soap and water.